Mon., July 23, 2018, 12:30 p.m.
President Donald Trump resumed his public campaign against the Washington Post on Monday, calling the newspaper an “expensive lobbyist” for Amazon.com, whose CEO, billionaire Jeff Bezos, owns the newspaper. Trump has previously argued that the online retailer has a “huge antitrust” problem. His administration could theoretically act against Amazon through antitrust, USPS, consumer protection probes or even a push against their government contract business. Amazon fell as much as 2.4 percent after Trump’s tweet, before recovering some of that loss. The shares were down 0.7 percent to $1,800.25 at 10:26 a.m. in New York. Trump’s broadside against the Washington Post follows a report in the newspaper Sunday that he was venting behind the scenes over a lack of progress in negotiations with North Korea on eliminating its nuclear program. Shortly before criticizing the Post, the president tweeted that “all of Asia is happy” with the progress and noted that North Korea hadn’t conducted a ballistic missile or nuclear test in months. Fifteen minutes later he began tweeting about Amazon. “The Amazon Washington Post has gone crazy against me ever since they lost the Internet Tax Case in the U.S. Supreme Court two months ago. Next up is the U.S. Post Office which they use, at a fraction of real cost, as their ‘delivery boy’ for a BIG percentage of their packages,” Trump said in a Twitter posting. Amazon wasn’t involved in the Supreme Court case, which pitted South Dakota against three smaller online retailers. The court voted 5-4 to let state and local governments require that online retailers collect sales taxes from customers, even if the merchant doesn’t have a store or warehouse in the state. Even before the ruling, Amazon charged consumers in states with a sales tax, though only when selling products from its own inventory. About half its sales involve goods owned by millions of third-party merchants, many of which don’t collect taxes. Brad Parscale, the manager for Trump’s 2020 reelection campaign, is also said to have complained about the company to Trump. The traditional independence and slow pace of investigations of the Justice Department or Federal Trade Commission could limit Trump’s ability to direct antitrust sanctions against the company. Amazon spent $3.47 million on lobbying in the second quarter of 2018, a company quarterly record, according to Friday filings with the government. 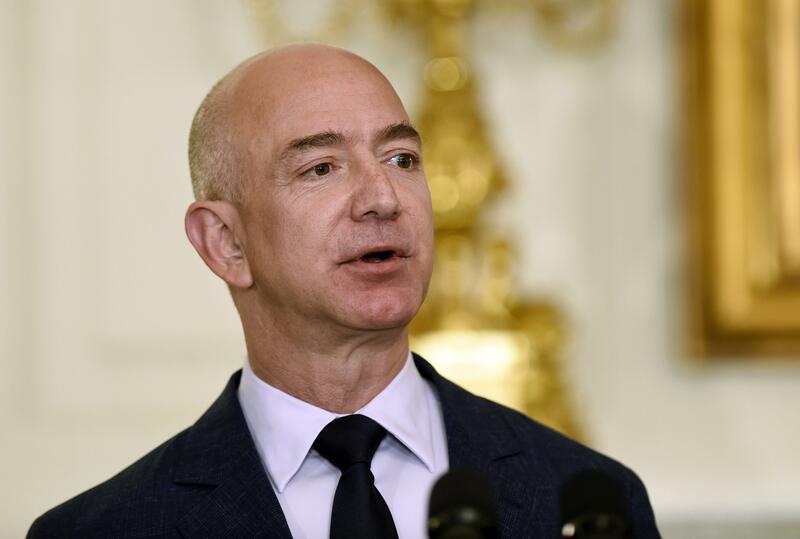 Trump has repeatedly attacked Amazon, the Post and Bezos. In April, after several attacks on the online retail giant, Trump created a task force to review the business practices of the Postal Service. Amazon regularly uses the Postal Service to complete what’s called the “last mile” of delivery. Trump has often said the postal service loses money because of Amazon. The service, legally prohibited from charging shippers less than its delivery costs, disputes the claim. Amazon has been the subject of intense scrutiny among a young generation of antitrust activists, who argue that the current antitrust enforcement framework is ill-equipped to tackle Amazon’s dominance and the potential harm it poses to competition. One of the architects of the argument, Lina Khan of the Open Markets Institute think tank, will be joining Federal Trade Commissioner Rohit Chopra’s office. If the administration opens an antitrust inquiry, enforcers would have to show the company has a monopoly in a market and that it abused its dominant position. But enforcers are intently focused on harm to consumers, and Amazon’s retailing platform is beloved by its customers for its breadth and convenience. An Amazon company spokeswoman, Jodi Seth, declined to comment on the tweets Monday. Published: July 23, 2018, 12:30 p.m.